How many books are there about Jane Seynour? Odd for an Anne fan, but she and Jane Seymour are my faves! Me too – Jane is always unfairly posed as meek, mild, plain, boring, and obedient – but she had to have a strong will and understanding of Henry to know that to survive his moods she had to be obedient to his wishes – Look at what happened to Anne! I love Anne. She’s my favorite Wife and Historic person. But if you forget about Anne for a second and try to understand Jane & Catherine (of aragon) it’s easy to like them. 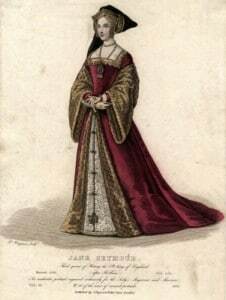 Catherine was a good and obidient wife adn fought for her daughter and to remain Queen. Jane…well Jane no one knows whether she was pushed by her family but still Henry singled her out like he did Anne and fought for her. For some reason, I have never done that. I have always hated Jane and Loved Anne but reading your comment reminded me that there are always two sides to a story. Thank you!! Jane is my favourite wife she knew how to push a subject but not to make him really angry and survive his moods. Anne is also a favourite wife of mine! I like Jane she tried to stand up to Henry about the in justice of the treatment of those involved in the Pilgrimage of grace. She was brave and like all the wives were in their own way she was strong .